I build mostly steel string guitars, and a few classicals. All of my newer guitars feature an adjustable bolt-on neck, which allows the user to change the neck angle or "set" -- a task which normally requires a skilled technician who must steam the neck joint to soften the glue. The fingerboard is supported by a neck extension, so it will always remain true and straight -- it is not glued onto the sound board, so there is no chance of a "bump" or a "hollow" where the fingerboard makes the transition from the neck to the top. To achieve a traditional look, this neck extension often fits into a recess or hole in the top. The top is free to vibrate in the upper bout, since it is not stiffened by being glued to the fingerboard. 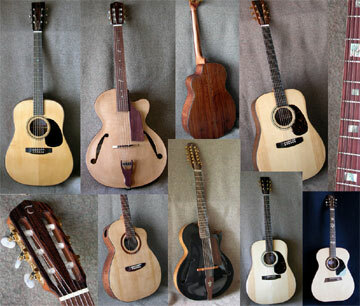 The guitars in this gallery are either already sold or not for sale, but the photos may give you an idea of the range of body styles and ornamentation available if you choose to have an instrument custom made.